The Polymers change the composition of the waste so that it becomes safe for disposal as regular trash. The purpose of the polymer component of the formulation is to immediately contain and encapsulate the waste. The enzyme component in the powder formulation is to ensure and accelerate the complete biological breakdown of the urine and stool to its most basic parts, thus allowing for safe disposal. Restop bags can be disposed of with normal trash, not in recycle bins, The bags are landfill-friendly and have been approved by your state's water resources board for landfill disposal. The patented double bag system is good for multiple uses and is made of puncture resistant, gas impervious, biodegradable material. 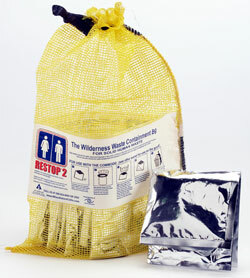 RESTOP products are required for hikers and climbers at Zion National Park and other notable venues worldwide including numerous Eco Expeditions on Mt. Everest. With over 10 million bags sold to the U.S. Military, FEMA, and other venues, Restop waste kits are proven products that easily provide for human waste containment at work or play.